My daughter just sent the dates when her family will be with us over the Christmas week. I can’t wait to see them. I can’t wait to decorate our tree and set up our plywood manger scene on the lawn. I can feel a sense of excitement building. How often do you say, “I can’t wait,” and mean a sense of eagerness and longing? We all know the other kind of waiting: slow-motion moments filled with irritation, when “I can’t wait” drives us crazy. Stewing in traffic we didn’t anticipate, or moldering in a doctor’s reception area long after the appointment was supposed to begin, or inching forward while a pokey checker struggles to find prices. It can feel like torture. How I wait is a choice. Is there some way to transform it? Take standing in line at the store, for example. Cell phones can distract while we wait in that line. I can use my phone to read e-mail, text, visit Facebook, or Google something. Or I can use my cell phone to sneak in some prayer. I have a few prayer apps and a bookmark for this blog. The entire Bible is available at usccb.org. I’m not self-conscious praying as I wait, because everyone else is on a cell phone too! Another choice is to pray silently for the cashier or the strangers ahead of me in a line. Every one of them carries a burden of some sort. I am surprising myself as I practice trying to contemplate while waiting in line. First, I notice the piped in music, and I let it go. I notice the conversations around me, but I allow them to float past. Sometimes I close my eyes and start a short Examen. How have I waited with Christ today? I review how I treated people during the last hour. I consider what I’m experiencing right now: physically, emotionally, and mentally. Sometimes I just imagine God looking at me right now. I blink to be sure that I’m keeping up with the movement of the line. But I keep my focus inward. Serious concentration helps me let go of the distractions. Then a few moments in line opens peaceful avenues inside. God may choose to grab this fleeting moment to provide me with some surprising insight. All of this is possible while waiting. Before I know it, the waiting is over. I give thanks. With my hot-headed attitude at waiting now in check, I can say that kind word to the frazzled holiday worker. I can focus on her instead of my all-important agenda. As I ponder Advent, I think about anticipation. My waiting is full of joyful hope. It’s the coming of our Savior, Jesus Christ! Image (cropped) by David Morris under CC BY 2.0. I finally got around to reading this reflection and it is timeless.I too try to slow down and reflect when I have to wait. I realize I will be finished soon but not in 30 seconds maybe 2 minutes. Is that really too much time in the grand scheme of things. wonderful reflection, oh why can’t you preach! while I wait, I’m on the lookout for someone who has only 2 or 3 items so i can invite her to go ahead of me. I always address the checker by her or his name and if it happens to be a saint’s name I introduce them to that saint.Oportunities abound while waiting as well as thanking god that i have enough money for my food.some people do not. Thank you, Tom. I already have a t-shirt like that in my closet; it’s been there for years. I need to let it go to the second hand shop, and welcome the waiting. I can’t tell you how often I forget that waiting is a blessing. 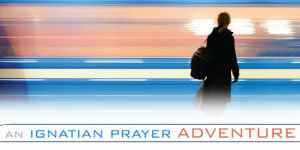 Very nice Advent reflection, one that is pertinent every day of the year. I have often thought of printing a tee shirt which would read on the back: “Whatever line I choose will stop at unpredictable times and for unimaginable reasons. Get out while you can! Otherwise prepare to wait…and wait…and wait…” After reading your reflections, I will cancel the order for such a tee shirt, and for two reasons. First, the obvious one now, is the recognition that waiting can be made into a very fruitful time with God. Second, and something I hadn’t thought about before, is the opportunity for me to be a grace for other people who need a really slow line to get some extra time to be in touch with God! Bless you Loretta for this beautiful, timely article. I just began cashiering at a grocery store for the first time in my life. I am definitely the cashier that is fumbling around trying to find the correct code for a purple sweet potato that I didn’t even know existed! I can see myself previously getting impatient with a new cashier. So, it is incredible what perspective brings now that I am on the other side. I love your prayerful ideas to help with the waiting. In the end, we are all doing are best in this life regardless of which side of the counter we are on. God bless you and Merry Christmas!! We are all doing our best! You are so right. And St. Ignatius was a big fan of expecting good motivations from each person. Each person, even us cranky ones, are an image of God. In line and behind the counter. This is a lovely reflection, especially at this time of the year when it is easy to get frustrated by the business in shops and amenities as we try to get everything done. After reading this I will actually treasure the waiting as time to ground myself in the real meaning of Christmas. Thank you. Thank you for your reflection — the authentic side of waiting & ways we are transformed in this waiting, if we but allow. I, too, am waiting, can’t wait for Him, the Prince of Peace in whom Alone waiting is changed for the purpose God has intended in the fleeting moments in time, to get real.God bless you & your family this Christmas. Well, hi to a fellow Sacramentan! I can’t wait to run into you somewhere, perhaps standing in line in front of me. I will be praying for you. Thank you for blessing all of us with your story. You invite me to notice, pause, and enjoy God laboring all around me. Please introduce yourself next time you see me at St. Francis. Hugs!